HOW THE JUDICIAL REVIEW WENT! The judicial review was scheduled for three days although we thought that it would only last for two. In the event, it lasted for the whole three days and there was a member of the MHRN in court at all times. The claimants were asking that further medical evidence should be sought by the DWP from a person’s own health care professionals prior to the ESA50 form being sent out for all people with mental health problems (called MHPs in court). 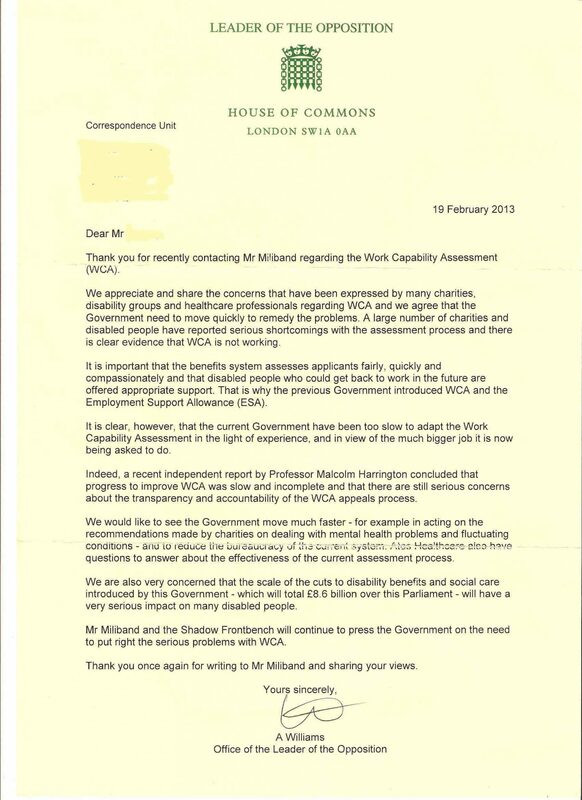 We believe that obtaining evidence at this stage will enable some people to be spared the distress of having to attend the face to face WCA interview and, where they do have to attend it, at least the assessor would know something about their condition and how it affects their functionality rather than the claimant being entirely at the mercy of the Atos computer and an unqualified Atos ‘Health Care Professional’. This in turn might spare some people from going through the misery of having to appeal. And, importantly, it would help identify people for whom regulations 29 and 35 apply. These regulations cover where there would be a risk to a person if they were found fit for work or for work related activity even if they had less than the required number of points for ESA. Obviously this change is only one way that the WCA needs to be improved on. Initially the MHRN was calling for the test to be completely scrapped but we are also realistic about what can be achieved. Who knows, it may be scrapped in a few years time but, in the meantime, we have to survive it. Now to the court case. The case was being brought under the Equality Act and was heard by three judges in the Upper Tribunal Court. It began with much debate about how exactly people with MHPs were being disadvantaged in the process of claiming ESA and the case for the claimants was that the self reporting aspect was often, for a variety of reasons, difficult for people with MHPs. In addition, MHPs may not be able to obtain further medical evidence for themselves. The DWP barrister argued that there was already procedures in place to ensure that further medical evidence was sought in appropriate cases. As well as the claimants’ barristers there was a barrister representing, jointly, National Mind, Rethink and the National Autistic Society, who also argued the claimants’ case and there was evidence written from consultant psychiatrists. It is hard to say, but, on balance, I felt that the existence of disadvantage may have been successfully established in court, but please, don’t rely on my impression! A lot of time was spent arguing about who the MHP claimants were being disadvantaged in comparison with. This was very much a technical point and an Equality and Human Rights Commission barrister was present to intervene here. The claimants were asking that reasonable adjustments are made to rectify a disadvantage (the adjustment being that medical evidence be sought by the DWP in all mental health cases) and therefore the ‘reasonableness’ of this adjustment was also up for debate with the DWP unsurprisingly arguing that it was wholly unreasonable, cost being one factor, the burden on doctors being another, and so on. So is there a disadvantage and in comparison with whom are MHPs disadvantaged? If there is a disadvantage, would the requested adjustment rectify this disadvantage? And is the adjustment ‘reasonable’? Obviously, as the case was being brought by individuals, there was some argument over whether the individuals concerned had been disadvantaged and whether the adjustments requested would have rectified that disadvantage. The DWP barrister tried every which way to counter the claimants’ arguments. The feeling among the members of the MHRN who attended the court was that the claimants got a fair hearing. The judges will be meeting with three high court judges and, I think I got this right, it is these high court judges who will be making the final decision. This will undoubtedly take some time to come through and we have no idea how it will go. Whatever happens, we’ll never give up!